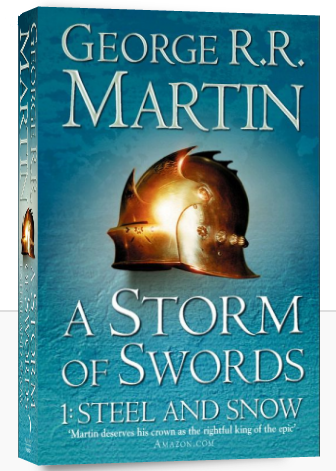 Книга "A Storm of Swords: Part 1: Steel and Snow"
Характеристики книги "A Storm of Swords: Part 1: Steel and Snow"
A STORM OF SWORDS: STEEL AND SNOW is the FIRST part of the third volume in the series. Winter approaches Westeros like an angry beast. The Seven Kingdoms are divided by revolt and blood feud. In the northern wastes, a horde of hungry, savage people steeped in the dark magic of the wilderness is poised to invade the Kingdom of the North where Robb Stark wears his new-forged crown. And Robb's defences are ranged against the South, the land of the cunning and cruel Lannisters, who have his younger sisters in their power. Throughout Westeros, the war for the Iron Throne rages more fiercely than ever, but if the Wall is breached, no king will live to claim it. 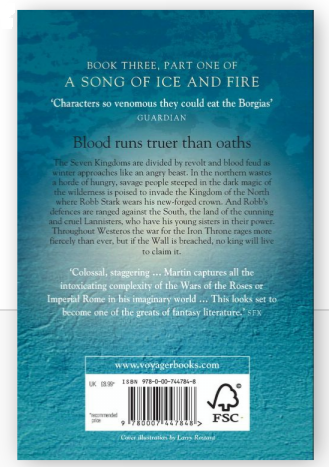 Третья книга романа-эпопеи «A Song of Ice and Fire». Роман «Буря мечей» издан на русском языке. Писатель, когда-то не воспринимавший фэнтези всерьез, стал мировой знаменитостью именно благодаря работам в этом жанре. Разделы, в которых можно купить "A Storm of Swords: Part 1: Steel and Snow"